Browsing for posts tagged Indian. The other night we were lucky enough to have our good friend Felicity invite us over to dinner to show off her mad cooking skills. 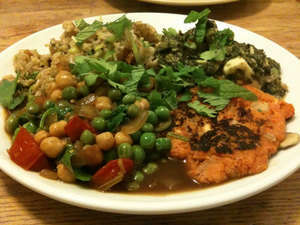 The theme of the meal was Indian—a cuisine that we love and is somewhat hard to find in Portland. Best of all, whenever we cook with Felicity she teaches us a lot of her cooking knowhow, and we come away able to better prepare our own meals. So we jumped at this opportunity to pick up some pointers.